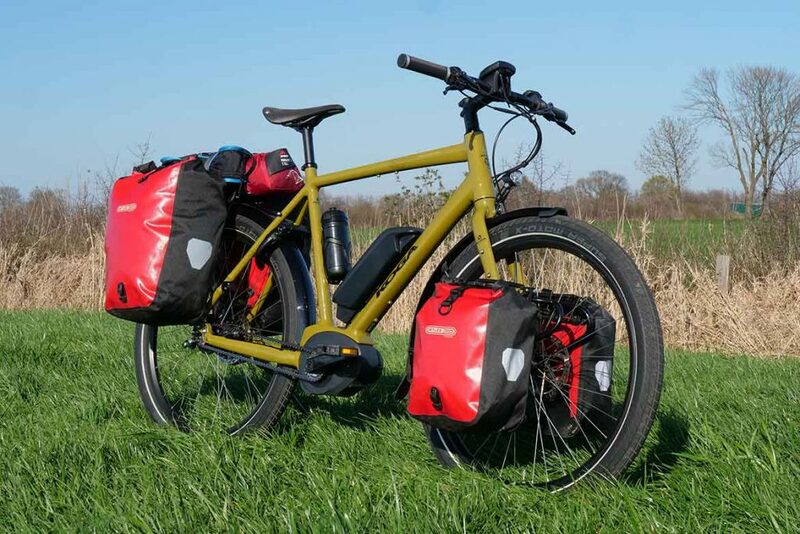 The Koga Signature E-WorldTraveller-S is the electrified brother of the famous Koga WorldTraveller, one of the most famous trekkingbikes in The Netherlands. Read the review and watch the video! 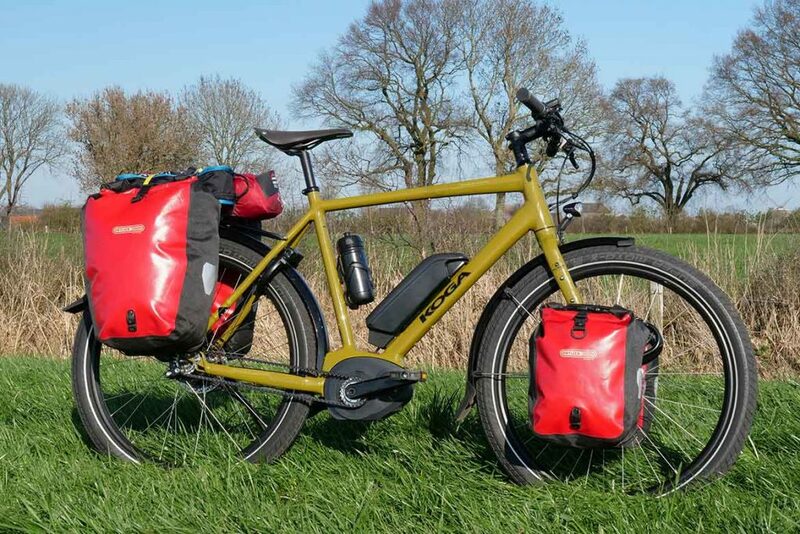 The Koga Signature E-WorldTraveller-S is the electrified brother of the famous Koga WorldTraveller, one off the most famous trekkingbikes in The Netherlands. Read the review and watch the video! The Koga Signature E-WorldTraveller-S Trekkingbike that I am reviewing has a frame size of 57 cm and fits well my length of 169,5 cm. The bike is fully loaded: Bosch Performance CX-mid engine, PowerPack 500 battery, 14-speed Rohloff E-14 speedhub, Gates beltdrive, Shimano XT disc-brakes, SKS fenders, B&M lighting, Trelock lock, Brooks C17 Cambium saddle etc. The total weight as stated by Koga is 24,4 kg. I measured a tiny bit more: 24,86 kg and for an E-bike so complete this is pretty ok. The E-WorldTraveller-S is equipped with carriers from the German brand Tubus. A lock is fitted to my test Koga. 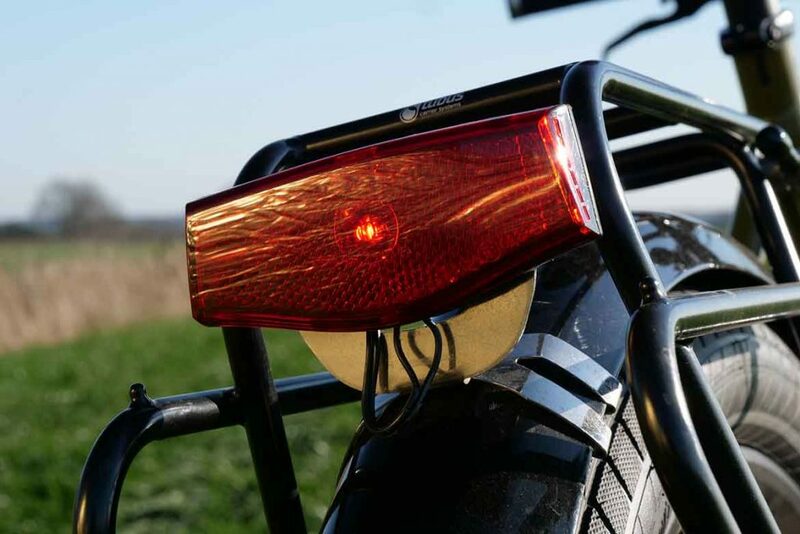 The rear light is from Spanninga. The Signature part in the name refers to the Signature configuration system of Koga. You ‘built’ your own custom bike on the Koga Signature website. Here you can adapt the ‘basic’ bike to your own demands. I did not do this since Koga lend me the bike and they made the choices. But I don’t think I would make any different choices accept for one. More on this later. 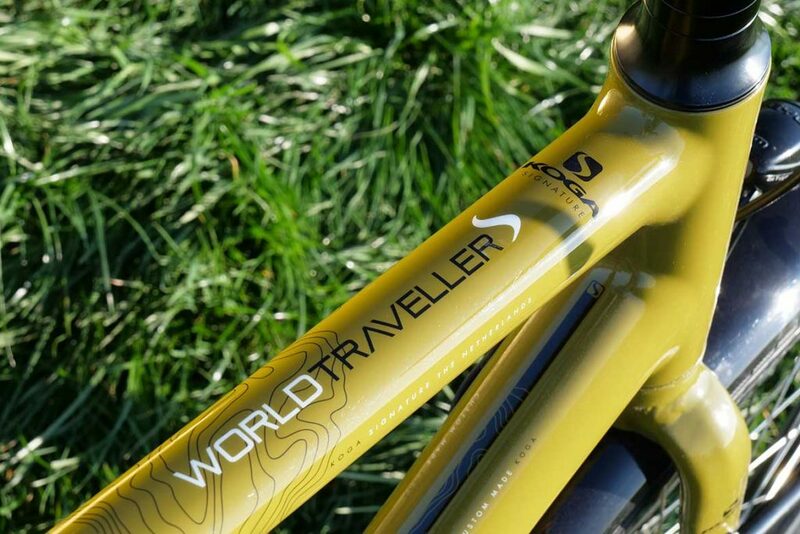 The Koga Signature E-WorldTraveller-S has an aluminum frame and fork. The frame tubes are manufactured by hydroforming – under water pressure – that gives the tubes their special shape. Thanks to this technique, tubes can be made in virtually any shape. This way tubes can be extremely thin – hence light – without losing strength. 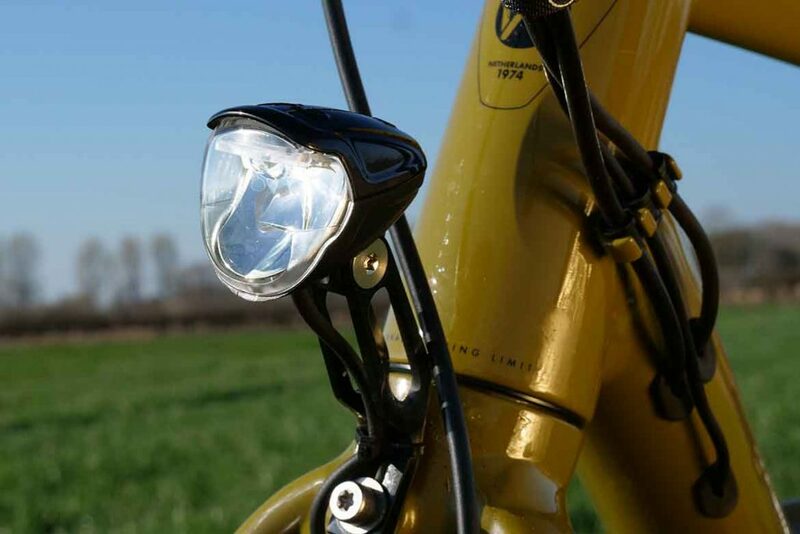 The fork has three attachment points for carriers or bottle-holders. The Koga Signature E-WorldTraveller-S can be customized through the Signature website. The head light is from Busch & Muller. 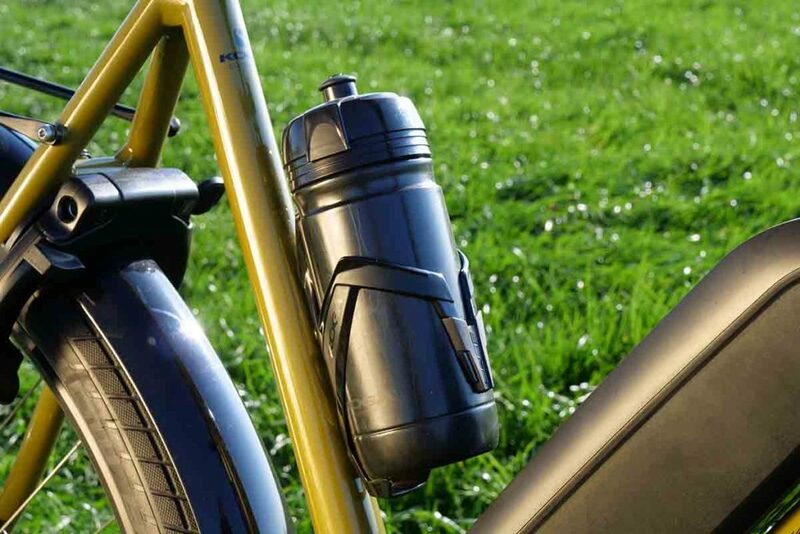 The battery is mounted on the frame where you would normally place a bottle holder. The frame has three places to attach a bottle-holder to: one on the seat tube, one underneath the top tube and one underneath the down tube. The first only fits a small bottle-cage but in the other two large 1.5 liter ones do fit. The Koga has three positions for bottle holders. This is the first bike I ride with a Bosch-Rohloff-Gates combination and I am impressed. 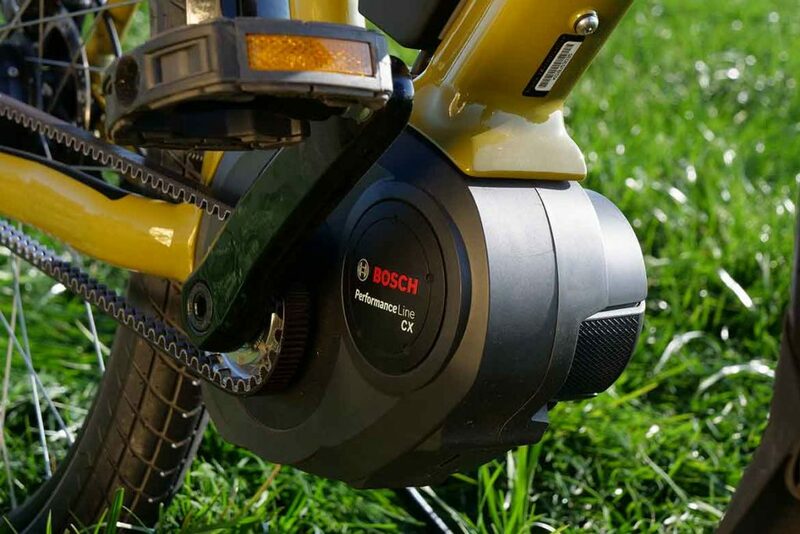 Since the Bosch motor is placed in the heart of the frame, the center of gravity and the balance of the Koga is spot on. The motor is operated with three buttons on the left side of the handlebar. The plus and minus symbols are used to change between the amount of support given by the engine. I have the choice between Eco, Tour, Sport, Turbo and “off”. This is all displayed in a screen that is located in the middle of the handlebar. The middle button is the information button an by pressing it I change the information in the display ranging from distance, speed, average speed, gear and also estimated reach. On the right side of the handlebar I have a second set of buttons. These operate the changing of gears in the Rohloff speedhub in the rear wheel. Yes, electric! The Bosch motor is a joy. 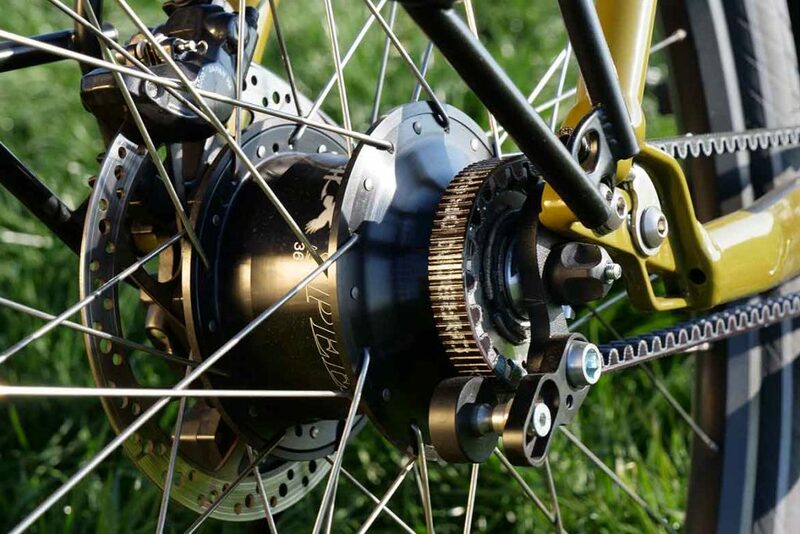 The Rohloff E-14 speedhub is a hub with 14-gears in the hub. Shifting is traditionally done by a twist-grip on the handlebar. Turn the twist-grip on the handlebar and the gears go up or down. The Rohloff hub has a name in being a wonder of technique that is bulletproof. Since the Koga is an E-bike is it logical that the changing of gears is automatic to. Reading the display is fine, also on sunny days. With the manual system it is possible to climb a steep hill, pause the pedals for a millisecond and shift very quickly before coming to a complete stop. The automatic system is not that fast and sometimes it happened to me that shifting was not fast enough to keep the speed going. Changing gears with pressure on the pedals is not something a Rohloff-speedhub likes when climbing. The electric system detects when the bike is coming to a stop. For example in front of traffic light, a stop to look at the map or take zip from a bottle. When the bike stops the system automatically shifts back to gear number 6 (you can program this to your desire) so that the bike is in the right gear to start biking again. This is super except when you ‘stop’ by doing a sur-place or turning a very tight corner on one spot. The system doesn’t register that the bike keeps moving and it changes into 6thgear. Something I don’t want at those moments. 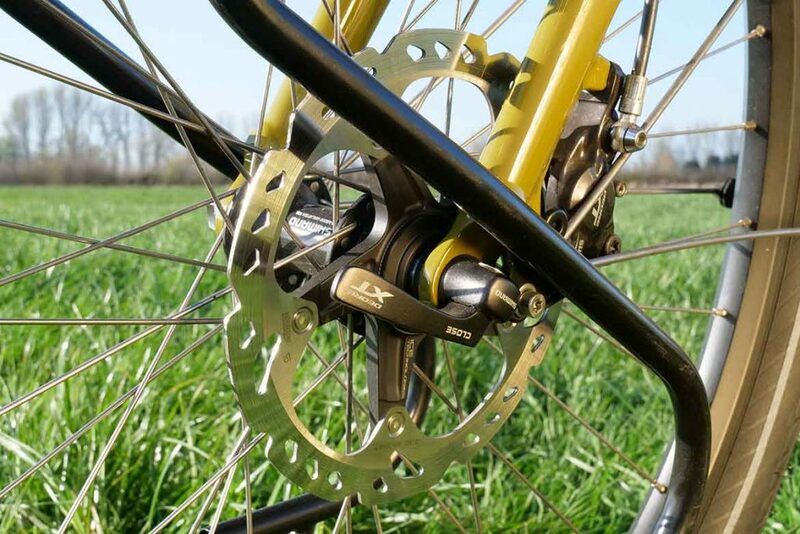 The shifting mechanism is positioned to the left side of the rear wheel. Are those two remarks a big thing? The first… maybe. It depends on how you are going to use the bike. The second…. I know I am a bit of a nerd that tries tot to touch the ground when stopping as long as possible. The Gates belt drive. I love bikes with a belt. The main reason is that a belt is a very quiet way of getting energy from one part to the other. And because it is so silent I enjoy the ride more because I hear more sounds from nature, ok… mainly birds and wind. Also the facts that a belt requires hardly any maintenance and is free from grease are a pro. I’ve had a lot of debates about the durability of a belt-drive on a trekkingbike and some issues I do understand and some I don’t. Replacing one on a long trip I understand because you need to bring one. That belts break easily I don’t understand, chains break too. 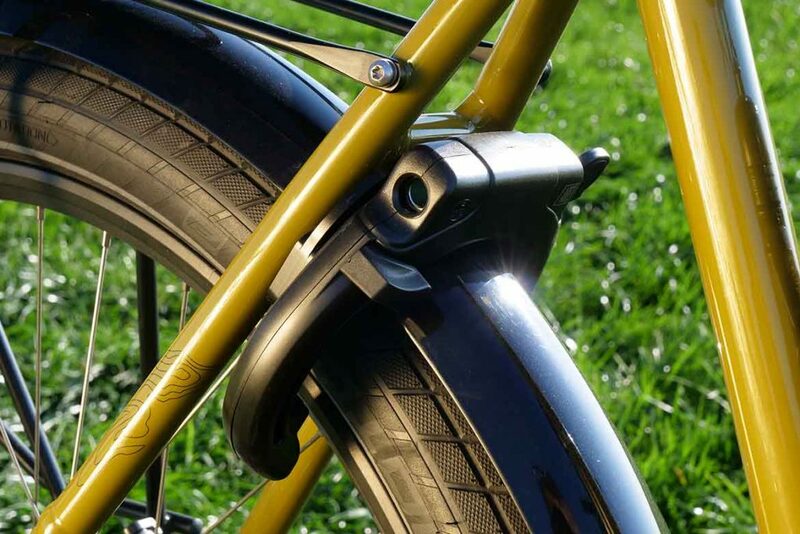 A belt drive on an E-bike is the proper thing to do: E-bikes are mostly used in environments with a high quality infrastructure so when things go wrong… help is at hand. By the way: a belt is a closed loop and in that respect different than a chain. To place or replace the belt the frame has an ‘opening’ (see picture) in the right seat stay. This does not compromise the frames integrity; one of the things I hear a lot. One thing that is important to know is that when the belt is not on the right tension and while putting a lot of force on the paddles, the belt is able to hop over the rear sprocket. This can lead to nasty crashes. To prevent this a snubber is mounted at the rear sprocket. This Snubber is a sort of little wheel that hover above the belt and prevents the belt from lifting so no sprocket hopping can occur. The Snubber prevents the belt from lifting so no sprocket hopping can occur. The E-WorldTraveller-S is equipped with carriers from the German brand Tubus. In the front Koga installed a Tubus Duo lowrider and in the back a Tubus Logo. The front is capable of loads up to 15 kg and the rear up to 26 kg. I always test the bikes I review with the same load so I can relate to bikes I tested in the past. In the front I have 10 kg in total and in the back 15 kg. 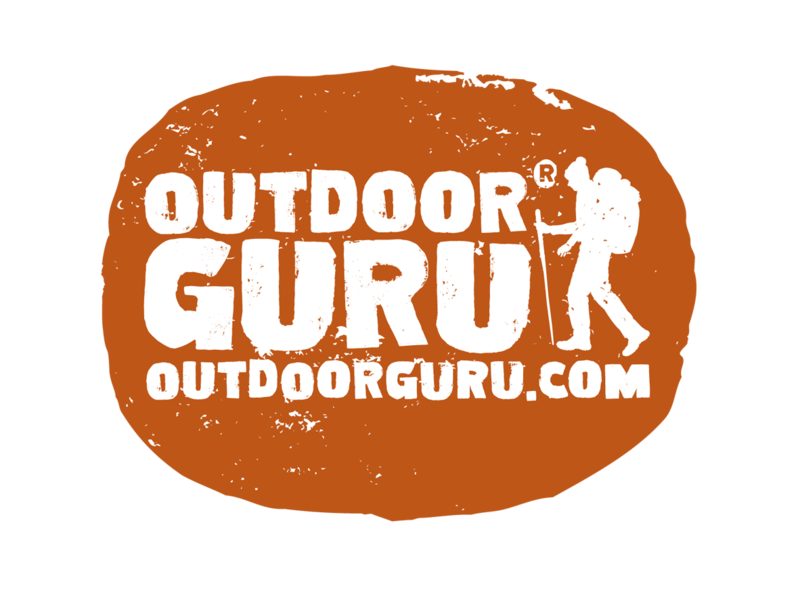 I use dumbbells instead of real camping equipment – although the weight is based on my camping trips – and because of this method I don’t have differences in packing. I mostly use Ortlieb panniers. With the weight in the panniers, the bike and me the total weight is 112,86 kg. The frame and fork have no problems whatsoever with this weight. The handling and steering is fine. The maximum weight limit of the Koga is 130 kg so be aware of this. 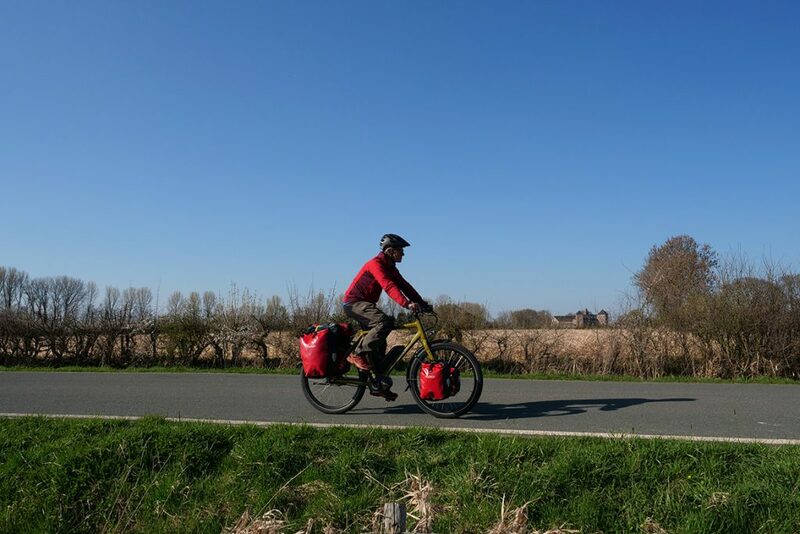 The range of an E-bike – any E-bike! – is probably the biggest issue with the most difficult answer. Why? Because there are so many variables that influence the range. 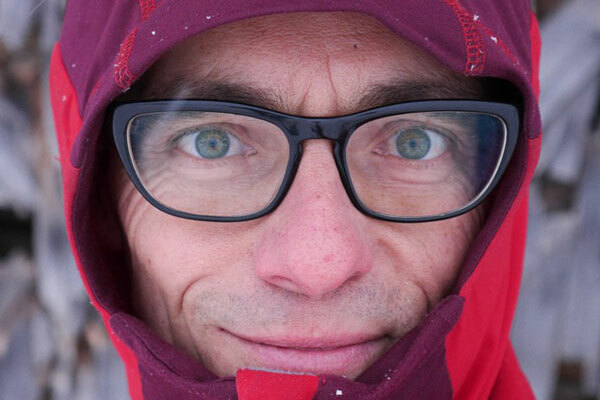 Think about the support modus – Eco or Turbo -, wind, temperature, hills, luggage, what type of bike, tires, weight of the rider and how much physical power you are delivering. The energy is stored in a Bosch Powerpack 500. I know how I like to ride an E-bike and that is giving a lot a power myself cruising at 25 km/h and end up being totally exhausted after the ride. I see it as a workout. Therefor I ride 70% in Eco and sometimes (5%) in Tour. On the home stretch I go for Turbo to maximize speed and have fun draining the battery and me ( I did 41,5 km/h max on a bridge descent, no support from the motor of course). 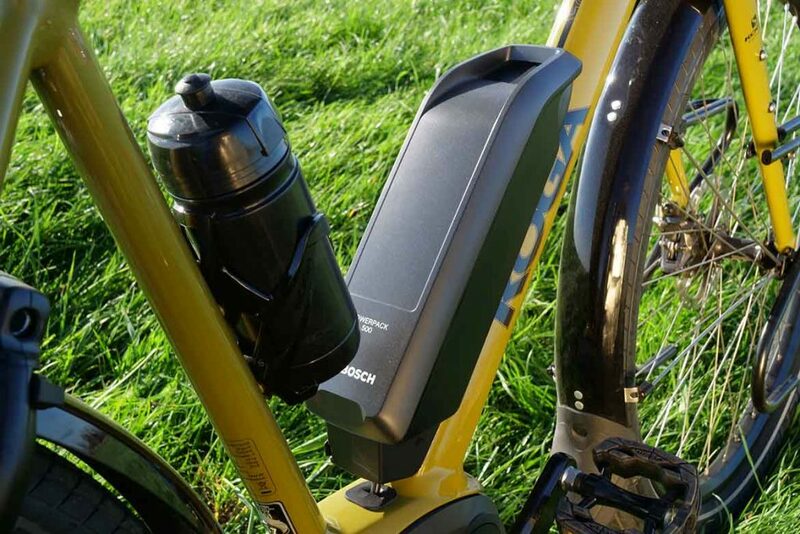 With the 113 kg and my way of riding I had a range of 100 km from the PowerPack 500 battery. That is decent for this kind of trekking E-bike. With playing between modes you can increase or decrees this dramatically. 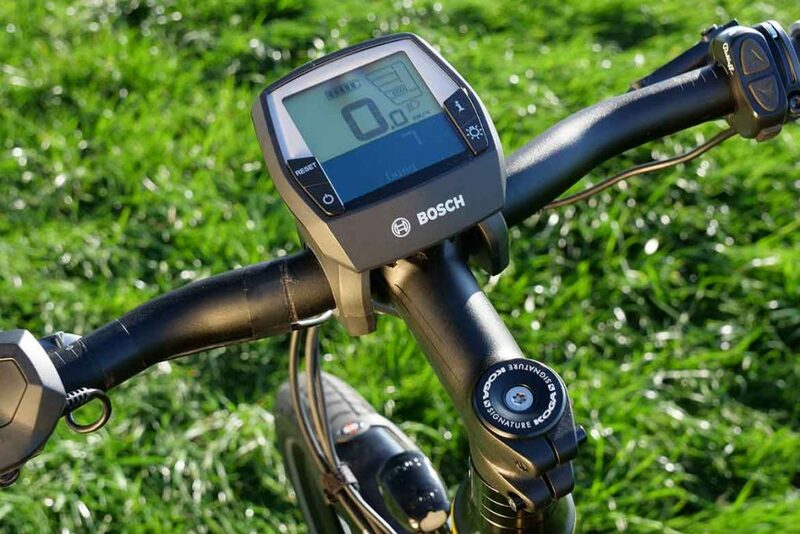 Bosch knows that range is a big issue and made an eBike range assistant to give a ruff calculation on range. I put the link below the article. Charging an empty battery takes about 3 hours an when the battery is ‘empty’ there is still some power left for the lights and changing gears. Then you have a normal but a bit heavy trekkingbike. Nice is also that the Bosch engine almost gives no resistance when riding without power. There was a time that disc brakes on a trekking bike where a no go. I didn’t understand it in those days and I am happy that times have changed in favor of them. 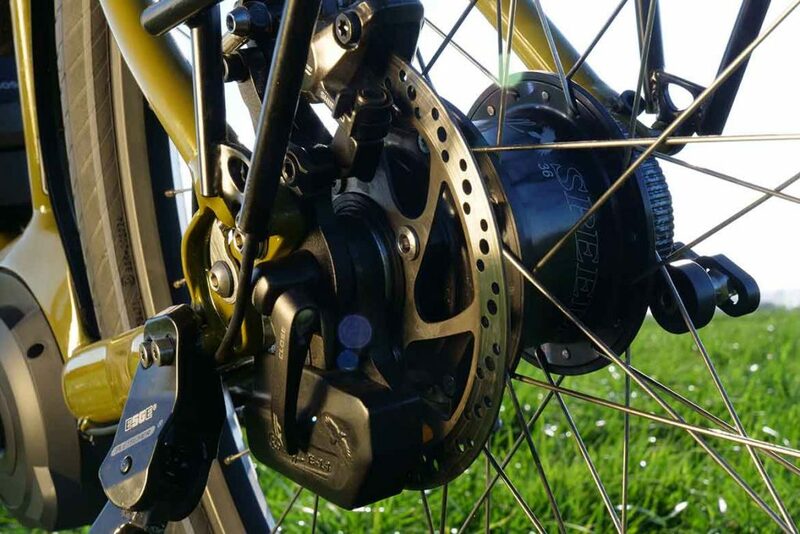 The Koga is equipped with Shimano XT brakes. Both discs are 160 mm and the BRM-8000 calipers have double pistons. 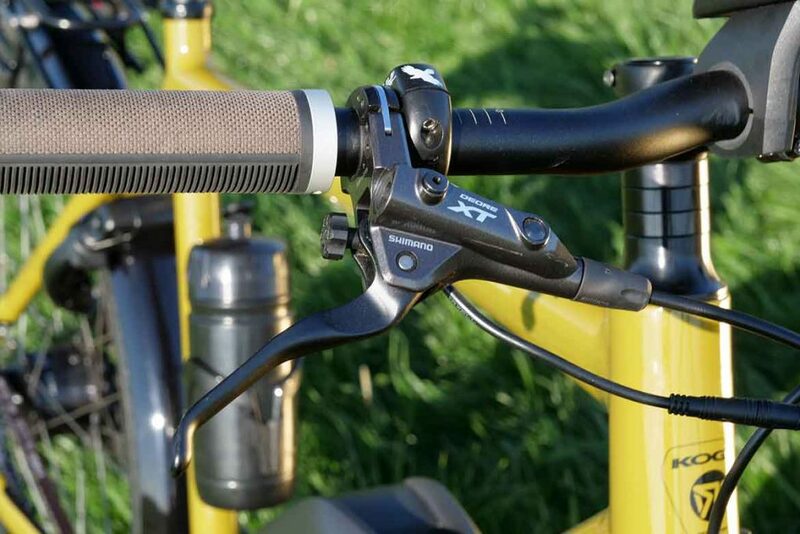 The Shimano XT brake levers are easy to adjust to accommodate smaller and larger hands. The dosage of the brakes is user friendly and braking force more than adequate, even with all the luggage. The brake disc are 160 mm and the calipers have two pistons. 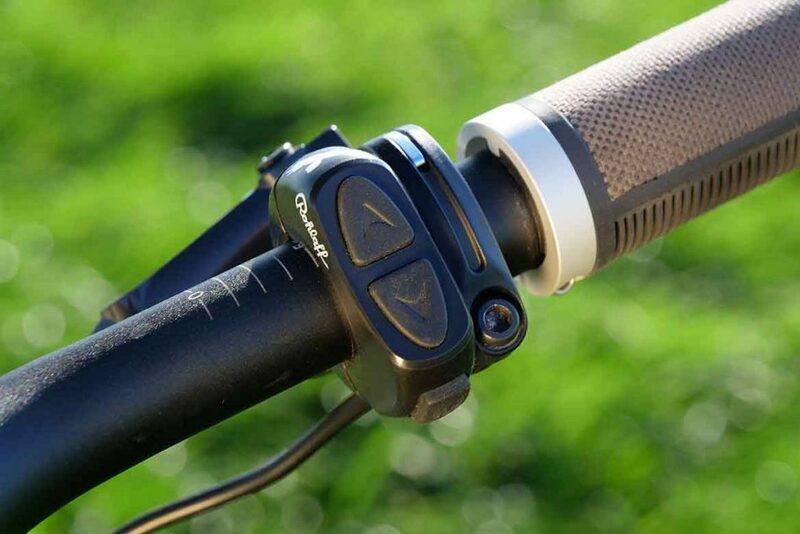 The brake levers als adjustable. The riding position on the Koga is sporty but comfortable. There is not a lot to play around with if you want to change the position a bit. You can only remove a few shims from the stem if you want a more sporty ride. The Koga-branded handlebar is 665 mm wide and the shape makes it extremely comfortable. The Brooks grips are not totally to my liking; they are too slippery on the top and that is the one thing I would change. 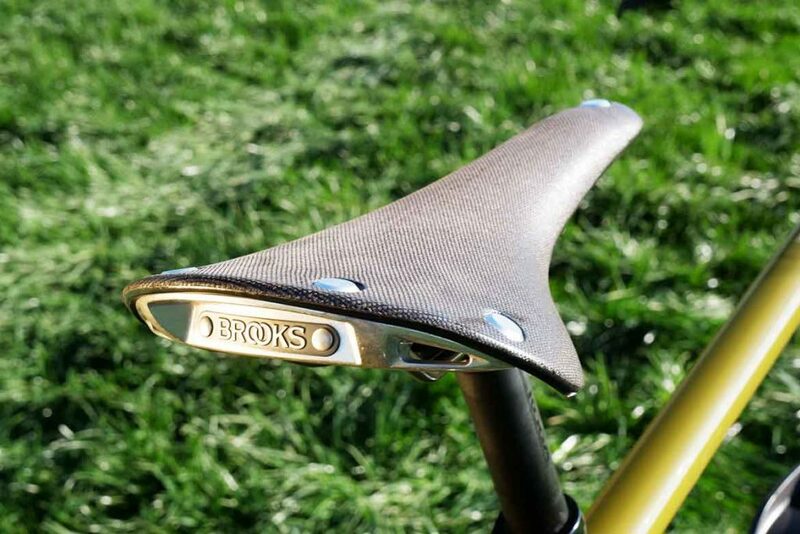 The Brooks C-17 Cambium saddle I do like a lot. More on the Brooks in this video. The riding position on the Koga is sporty but comfortable. I love the Brooks C17 Cambium saddle. The behavior of the Koga is very predictable and I do like the fact that it is a bike with a 27,5” wheelset. For me – small guy – this is the perfect balance between a compact bike setup, riding characteristics, and comfort. The rims on the E-WorldTraveller-S are from Ryde with Schwalbe Super Moto X 27.5 62 mm around them. On straight roads it is a super stable combination and when it gets a bit more curvy the behavior is what you would expect from a trekking bike: it goes with the flow. Frame and fork are fully loaded up to job. The beefy tires perform their best on flat and even tarmac. And when properly inflated they give little roll resistance. When riding more adventures roads – gravel, unpaved country roads – I had to experiment a bit with the tire pressure to make the ride a bit more comfortable. But with balloon tiers this big that is never a problem.